The 11th International young scientist conference “DOC 2015” is arriving soon! 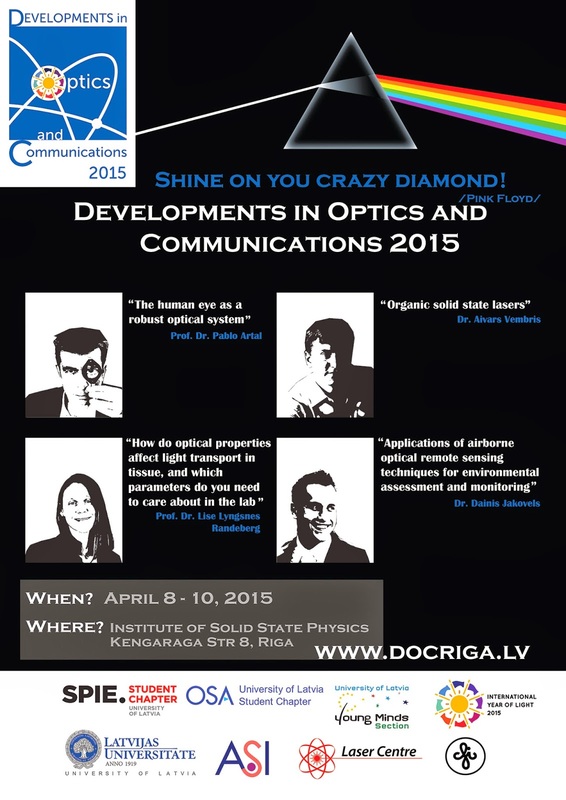 On behalf of SPIE and OSA student chapters from the University of Latvia we are pleased to invite you to join us in Riga, Latvia, for the 11th International young scientist conference “Developments in Optics and Communications 2015”! The University of Latvia SPIE (UL SPIE) Student chapter is a part of an international society advancing an interdisciplinary approach to the science and application of light. A lot of student leaders have been and still are members of this chapter. We offer an interview with a long-lasting member of the UL SPIE Student chapter, Inga Saknite who holds a Master’s degree in Physics and is a promising PhD student. She has been awarded with a Travel Scholarship by SPIE to attend the worldwide conference “SPIE Photonics West 2015” – the world’s leading laser, photonics and biomedical optics conference, held in San Francisco, USA. Let’s hear about her impressions!